There are some who see a cycle of boom and bust as inevitable. But as Britain and much of the Western world faces up to a downturn, it's easy to look back into the past and find nasty decades, writes Finlo Rohrer. The pundits are foretelling hard times at the moment and doing their best to explain why the world economy could be headed for trouble. But imagine a time when people struggled to understand why they were going hungry. Between 1440 and 1460 England was suffering a late medieval equivalent of the credit crunch. The country was still recovering from the effects of the Black Death a century earlier. 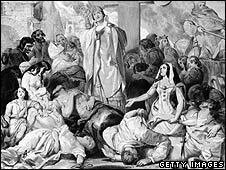 The population had dropped from as much as five million before the plague and its recurrences to a mere 2.5 million in 1440, says Leicester University economic and social historian Prof Christopher Dyer. The consequences for the English economy were dire. "The grass was growing in the streets, land was lying uncultivated. There were not enough people to occupy the land," says Prof Dyer. 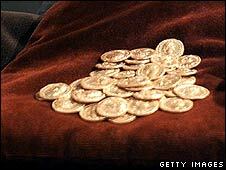 The second part of the double whammy for England was a shortage of bullion, as supply from traditional sources of silver in Germany and in parts of Hungary dried up. At the same time, the balance of trade was shifting in favour of the East as expensive luxury commodities were sold to western Europe for large quantities, Prof Dyer says. The lack of money caused price deflation for farmers in England, at the same time as labourers were able to demand higher wages because of the depopulation. "People knew things were going badly. They talked about low prices for farmers, they couldn't pay their rent because they weren't getting enough." The expensive Hundred Years War also took its toll. But help for the English economy was around the corner. New European sources of silver were found and by the end of the century the discovery of the Americas had opened up the possibility of untold quantities of bullion. In the late 1830s and the early 1840s life in Britain was pretty miserable for some. There was political instability as anti-Corn Law activists tried to get the government to accept free trade and the Chartists pushed for the universal franchise. And economically, much of the country was getting to grips with its first modern cyclical period of bust, says Oxford University historian Prof Jane Humphreys. The aftermath of the Napoleonic War could have led to a boom, but exports were soon stifled by a wave of international competition enabled by the end of hostilities. 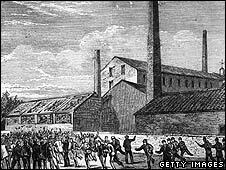 Textile workers, and particularly cotton workers, in the industrial north of England, and Scotland were worst affected. "Whole sectors of the community were dependent on one particular industry," says Prof Humphreys. "It was a relatively new experience. Before, if there had been an industry adversely affected, other ways of living held up. Now you had very sector-specific communities." There was also a rapid population growth, which worsened the effects of unemployment. Food prices were high due to the Corn Laws, and wages for many were low. For those who slipped into the economic abyss, life could get very unpleasant indeed. "In 1834, they introduced a system of workhouses. There was less eligibility - you had to demonstrate your real need by being prepared to go into the workhouse, so the poor law had been tightened up - it really represented a tightening of attitudes towards poverty." But the nasty decade did not last. By 1846, things were getting better; struggling businesses went bust, and the mills that survived had been made leaner and more efficient by the years of paucity. By 274, the Emperor Aurelian was determined to shore up stability, with a reform of the silver coinage high on his manifesto. Sadly, says Dominic Rathbone, professor of ancient history at King's College London, the result was chronic inflation. "He introduced a new silver coin but retariffed it. They would only accept the new coins back [as taxes]." "There was a vague realisation that if you suddenly minted a lot of money interest rates would fall. Not only was it economically bad but it was morally bad to use debased silver coins." The problems dissipated under the Emperor Diocletian but were not finally resolved until the issue of the gold "solidus" coin under the Emperor Constantine in the fourth century. The lesson learned was that coinage was something that had to be handled very carefully for the sake of the whole empire. "Fundamentally it was the government stopping messing about with the coinage," says Prof Rathbone. Ah, will we ever learn, products from the East upset the balance. Reliance on a single industry/way of realising profit is a dangerous game, and throwing cash at economic problems may help in the short term but sets you up for gross inflation. Perhaps we should look at being more self reliant and accept we can't have everything out there, be more diverse in how we invest, and in times of economic hardship tighten our belts. It is interesting to hear about the problems with Roman currency in the late 3rd century AD. There was indeed inflation at this time but it did have the benefit of enabling more people to use money more often. This is because the coins were of a lesser value and hence could be used in more transactions. We should remember that in the AD 270s, when the coins in Britain were of a very poor quality, many villas began to expand in size, starting a golden era in rural Britain that lasted well into the 4th century. Such economic growth in the countryside coincided with low quality coinage which warns us about equating bad coins with a weak economy. This is not always necessarily the case. The article on the 1440s "credit crunch" seems to be giving a very old style mercantilist view as to the causes of their problems. Is the article trying to give a 1440s view on the causes of economic problems with the economic theories of the 1440s? I thought the notion of mineral shortages in certain metals (mainly silver in this case) leading to either recession or growth was dismissed in 1776 with Adam Smith's Wealth of Nations. Does anybody know if Greenspan, Bernanke or Brown have ever heard of Emperor Diocletian? "Fundamentally it was the government stopping messing about with the coinage." "Britain: The hungry 1840s"? It was pretty miserable and hungry for another part of the UK in the 1840s: Ireland. Typical Anglocentric view to airbrush the Irish Famine (1845-1849) out of British history.